The first United Nations Secretary-General from sub-Saharan Africa and Nobel Peace Prize Laureate, Kofi Annan, who passed away this month at the age of 80, will be mainly remembered for his successful career as an international diplomat, a humanist, and a peace-builder. But, in many ways, his legacy is also defined by his failures and the role they had in shaping his tireless efforts towards a world that would put human rights above politics. In 1995, just a year after Rwanda, the UN system failed again at responding adequately to avoid and stop the genocide in Bosnia. Around 8,000 Bosnians Muslims were killed by Bosnian Serb Forces in the Srebrenica massacre, the worst on European soil since the Second World War. The solution came with the new understanding of state sovereignty as a conditional right that cannot overlap individual rights and with the development of an international norm that allows intervention to protect civilians against gross and systematic violations of human rights perpetrated in or by a sovereign State. In 2006, following a World Summit, the UN Security Council unanimously adopted the Resolution 1674, affirming the responsibility to protect populations from genocide, war crimes, ethnic cleansing and crimes against humanity, and committing the Security Council to action to protect civilians in armed conflicts. This became known as the Responsibility to Protect Doctrine or R2P. The “finger-pointing and name-calling” are emblematic of how the UN Security Council usually deals with international conflicts. Countries put their own national political interests above the human rights, resulting in arbitrary decisions whenever a crisis requires the application of the Responsibility to Protect doctrine. In other words, what determines action, in each case, is the political will of the member states rather than the humanitarian urgency. 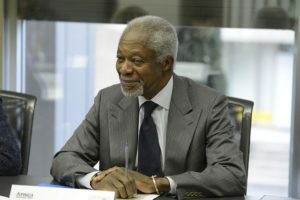 May Kofi Annan rest in peace. And may we keep the humanitarian values that guided his efforts as a peacemaker alive.